Do you crave thrills? Or do you like to stay on solid ground? 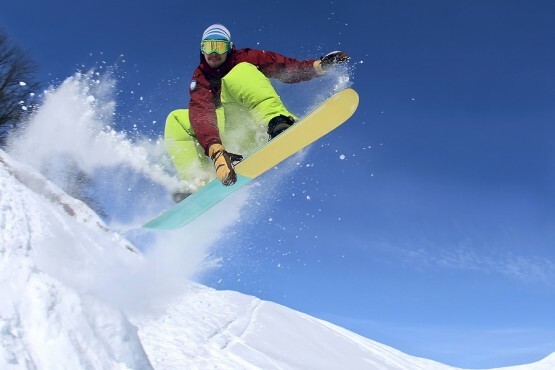 From freeskiing and snowboarding to hockey and curling, find out which sport best warms you up when it’s cold outside. Find out if you should be gliding, sliding or flying. Your sport is freeskiing. Free to jump, free to fly, free to spin … from its classic roots to its new-school form, this sport (sans competition) is all about freedom. Your goal is to get the most out of life, so you’re always up for a challenge, not afraid to fail and have to be on the cutting edge of whatever is in the moment. Your sport is snowboarding. You like to mix things up, so it’s only fitting that you’d choose to maneuver a board down a snow-covered slope instead of sand, surf or concrete. While you set a steady pace in life, your inner rebel craves that speed-demon adrenaline rush once in a while. As for pain? You’re too busy having fun (and looking extremely cool) to worry. Your sport is hockey. What’s a workout without fierce competition? Not only do you enjoy the intense action, you get fired up over a little danger in the rink. But the best part is winning; you love to bask in each victory against your opponent. Your sport is figure skating. To you, sports are a very personal form of art. Figure skating feeds your ambitious, hard-headed and competitive nature. Each routine is both a carefully choreographed performance and a personal test of courage. And you’re destined to be good if you’re willing to fall while you climb your way to perfection. Your sport is curling. You believe sports rely on wit and sportsmanship, so the sport sometimes called chess on ice is more your style. In curling, the greatest challenges take place in the head, so your brain gets as much of a workout as your body does. Patience is essential to beat your opponent, but if you don’t emerge victorious, you’ll still feel great after a handshake. If you had to fly through the air, how would you do it? Do you care what you’re wearing? Not really, as long as I'm comfortable. My clothes have to reflect my personality. Only if I'm trying to impress someone. I try to wear what's in style. Always. I have to be unique. Do you care what youre wearing? Which form of exercise is most appealing? My sport was SNOWBOARDING! Not surprising considering I love snowboarding. I got Hockey and I love it! I always ski it’s fun for me, but I could try something else. I wouldn’t mind snowboarding, but I wouldn’t really have any way of steering besides my body. I would rather ski because I would have those steering stick things t help me steer. What’s Your Ice Cream Personality?